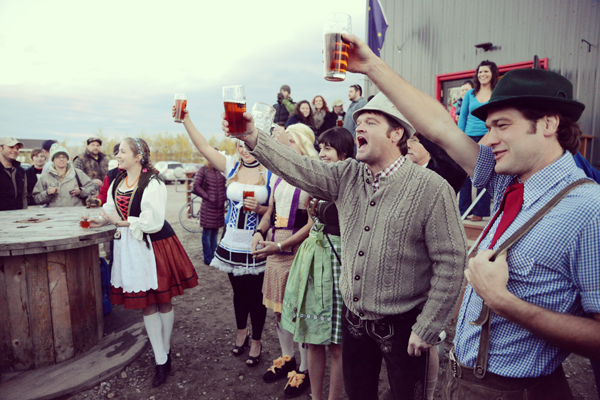 FAIRBANKS — Hoodoo Brewing Co. is going German — more so than ever before. Oktoberfest is a 16-day festival in Munich, Germany, celebrating all things beer. Hoodoo, the locally owned brewing company in Fairbanks’ industrial district, is getting in on the fall festivities with the release of a new brew and activities planned at the brewery at 1951 Fox Ave.
Photo courtesy of Nate Hokenson, Fairbanks, Alaska. The festival will begin at noon Saturday when Hoodoo will tap its German-style Marzen/Oktoberfest lager. The Pretzel Chef will be on-hand in the beer garden with freshly baked soft pretzels and pretzel dogs Saturday through Sept. 28. Then, Gold Digger Dogs will join the festivities by offering Alaskan Grown specialty hot dogs Oct. 1-5. HooDoo will also host a variety of contests like a stein holding competitions, a “Germaniac” costume contest (you’re encouraged to grab your hats, dirndls and lederhosen) and a not-to-be-missed yodeling contest. HooDoo also will have limited edition Oktoberfest 2013 T-shirts and posters available that were designed by Fairbanks artist Lucas Elliott. The new HooDoo Oktoberfest displays a deep hazy orange color, with a tight, off white head. The aroma has a rich malty aroma that comes from German malted barley. Slightly toasty, the beer is all about the malts, with little sign of aromatic hops. A malty sweetness and honey notes are detectable with a clean hop bitterness on the palate to balance it out. It pairs well with hearty German fare such as sausages and pretzels, butter spaetzle and creamy fall soup. The brewery is located at 1951 Fox Ave. Its hours of operation are 3-8 p.m. Tuesdays through Fridays and 11 a.m. to 8 p.m. Saturdays.